Join us for a Moonlit Tarot Workshop! 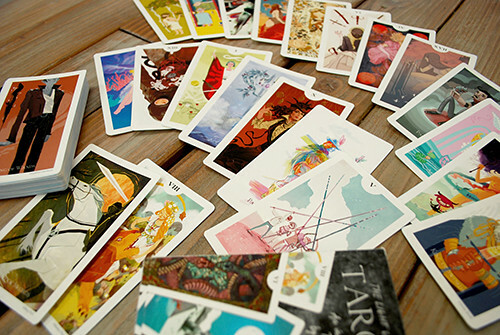 If you are interested in tarot cards, want to learn to read, or just curious, we have a great class coming up at Light Grey Art Lab. This Thursday, January 16th from 6-9PM, Lindsay Nohl will be teaching a free workshop on reading and understanding the art of tarot. Through this class you will learn about some of the symbolism and relationships in the cards, different structures and ways of reading, and the stories of the minor and major arcana. By the end of the class you will be able to start your own mini readings! You can see more information about this event on the Moonlit Tarot Event Page here! If you have a deck, feel free to bring your own to follow along! In 2012, Light Grey Art Lab published a collaborative artist deck, including the works of illustrators, designers, and fine artists from around the world. Each artist was given a card at random (to the luck of the draw) and ask to redesign and interpret the meaning and symbolism of the card. 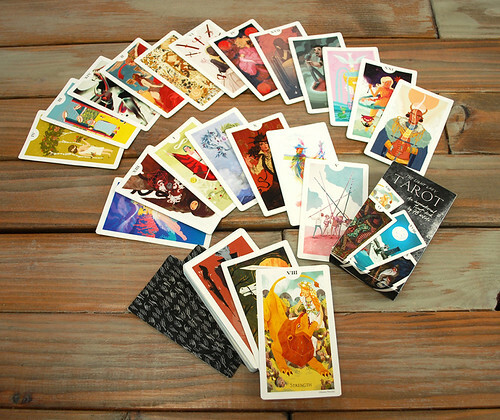 As a result, this unique tarot deck is full of beautiful color illustrations, storytelling imagery, and a very readable and comprehensive deck. Along with the cards, there is a 32-page guidebook that will help you along as you learn to read tarot! This is a limited edition publication. You can see the full details of this project here. We will have several of these decks available for practice and learning during the course! We would love to teach your all of our mystical knowledge- hope to see you here!